Ya'll know I love to sew potholders. It's the perfect way to use up fabric and batting scraps. And to practice quilting. Plus when you're done you have a beautiful and useful item. Except for the Insul-bright insulated batting, these were made entirely of scraps from other projects. So let's get started! Then cut out 1 hexagon from the template in my free pattern. 1. For the first round, use your shorter strips that are 4'' long. Lay the first strip on any side of the hexi (right sides facing). Line the bottom of the strip up with one corner of the hexi and let the rest hang off the top. 2. Start sewing half-way down the first side of the hexi with a 1/4'' seam allowance. This is the partial seam. You will sew half of it now, and half of it later. 3. Open the fabric and press or finger press flat. Trim away the extra triangle of fabric to make a straight edge for the next strip. 4. Working in a clockwise direction, place the second 4'' or longer strip of fabric on the next side of the hexi. This strip should cover the hexi side plus the first strip. Sew with a 1/4'' seam allowance. Press or finger-press the second strip open and repeat Step 3-4 until you have 5 strips sewn to the center hexagon. 5. Fold back the first strip to trim away the little triangle from the last strip. 6. Pin the first strip over the last strip, taking care that it extends in a straight line. Stitch, ending your stitching in the same place where you began. Press. 7.. Using a ruler and rotary cutter (or a pencil to mark the place to cut) trim away the extra fabric from each strip. You should be able to align the seam lines with the 1 3/4'' mark on your ruler and slice off the top. 8. Repeat steps 1-8 with the 6'' or longer strips for the second round. 9. 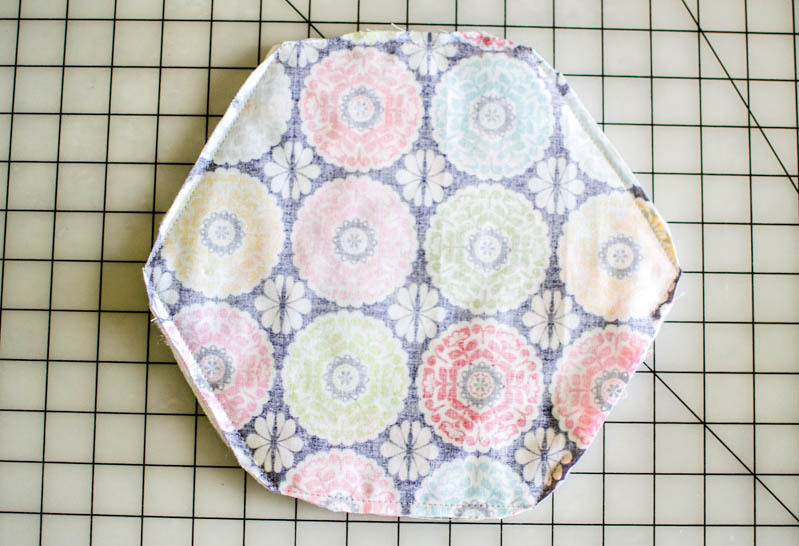 Use your finished 'top' as a pattern to cut out one backing, one piece of Insul-Bright, and one piece of cotton batting. 10. Stack the finished top on the piece of Insul-Bright (shiny side toward the top) and 'quilt as desired,' or don't quilt at all if you wish. On this one, I quilted in a spiral pattern in the middle of each strip and stitched ‘in the ditch’ along the inner seams. 11. When you are done quilting, fold the 6'' scrap of ribbon in half and baste the ends near one corner of the potholder. 12. Stack the piece of cotton batting on the bottom (if you are using one) and the backing on top (right sides together). Pin in the corners. Stitch all the way around, leaving a 4'' opening on one side (not the side with the ribbon). Clip the corners without cutting the stitching. 13. Turn right side out, pushing all of the corners out. Press. Hand sew the opening shut. Alternatively, you could topstitch all the way around the potholder to close the opening. But I like the puffy edges so I would rather not topstitch. Now comes the hard part... are you going to keep it or give it away?